ScotDIST will be hosting a nationwide meeting for new students from across the eight STFC Centres for Doctoral Training in data science. The meeting will include talks from data scientists in academia and industry, and workshops and tutorials covering cutting edge techniques for data scientists in programming, machine learning, statistics, and data management. Accomodation. We have reserved a block of rooms at Masson House. (See Google Map). Please confirm your accomodation requirement on the registration page. If you want to stay somewhere else, thats ok, but please make sure that is clear when you register. Catering. Breakfast is included at Masson House. Lunches and tea/coffee breaks will be at the Bayes Centre. 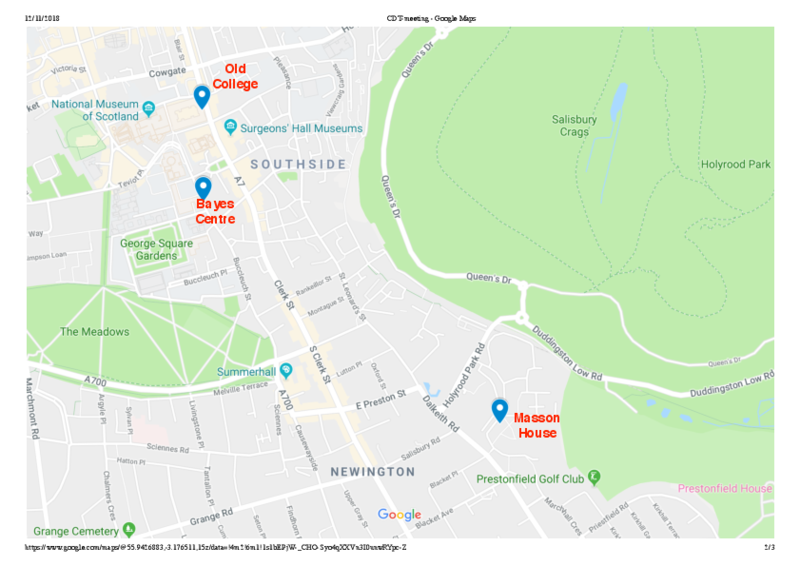 Dinner on the first night (Monday 19th) will be at South Hall, right next door to Masson House. Dinner on the second night (Tuesday 20th) will be in the historic Playfair Library. Travel. Please arrange your own travel, bearing in mind the start-finish times. 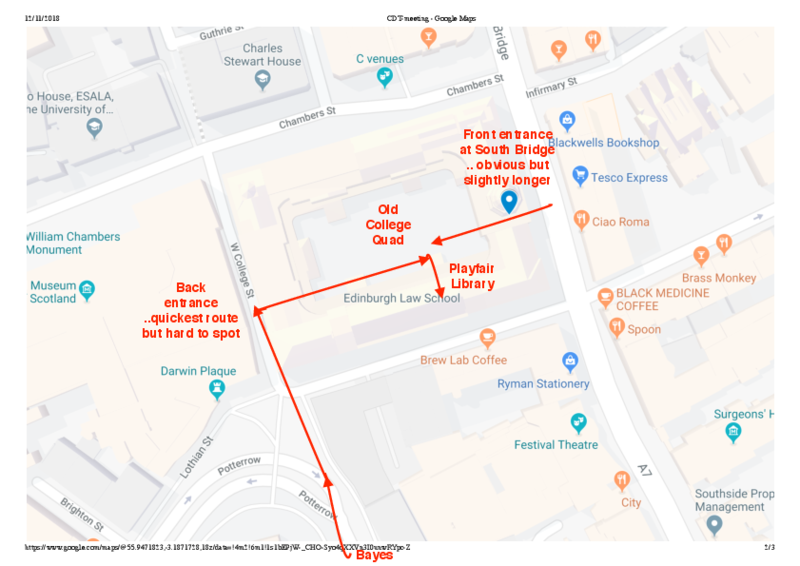 To get to Pollock Halls from Waverley station, walk up Waverley bridge to Princes Street. Buses 30 and 33 both go to Pollock Halls and leave every 15 mins. Fixed single fare £1.70 on bus. Or you can get the m-ticket app but that has a £10.00 minimum - see Lothian buses website. 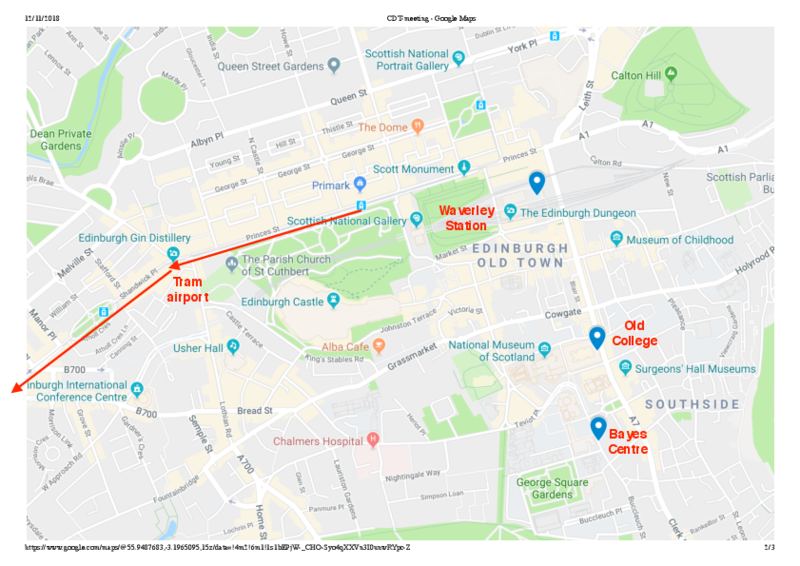 From the airport, take either the airport bus (£4.50) or the Tram (£6.00) to Princes Street. Alternatively, a taxi from the airport to Pollock Halls will be about £25, and from Waverley is about £10. On the way back, taxis are quite easy to flag down on the street, but you can also phone Central Taxis at 0131-229-2468 or City Cabs at 0131-228-1211. Both those companies also have apps you can get on your phone. Programme. The overall programme is now (very nearly) complete. You will find it at the link below. The general plan is that we start at 6pm on Monday 19th, with a reception and posters, followed by short plenary talks and then dinner. Tuesday 20th will be a full day starting at 9am with both plenary sessions and parallel workshops, followed by dinner in the evening. Wednesday 21st will be a half day beginning at 9am, followed by lunch, so we will be all done by 2pm. Tutorials/Workshops. 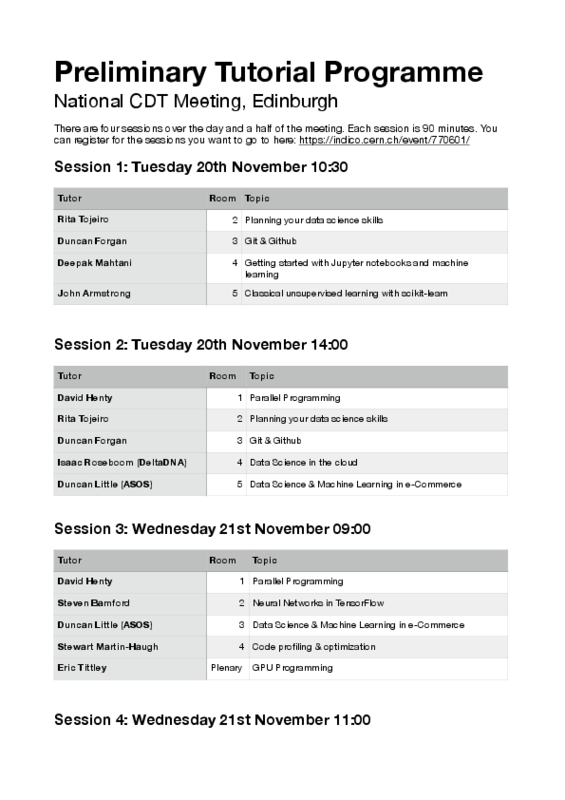 As well as the plenary sessions, there will be workshop style tutorial sessions run in parallel. 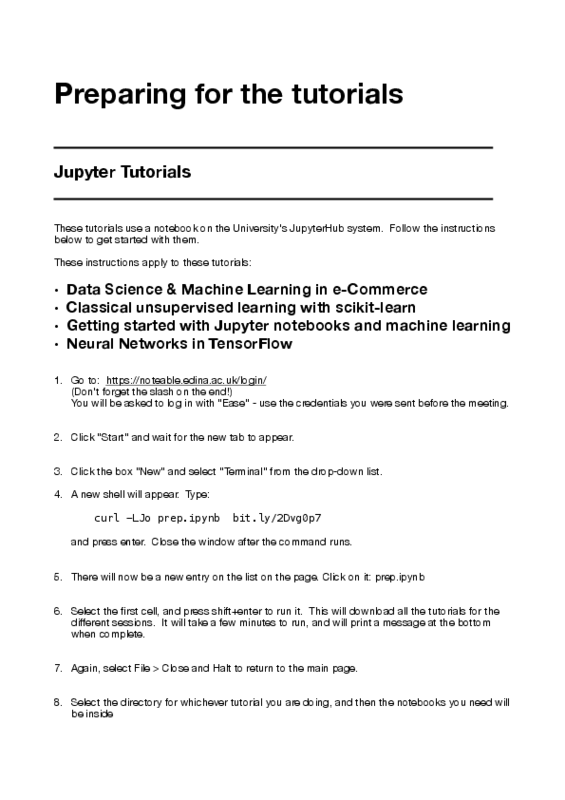 There will be sessions on basic and advanced Python-based data science, using Git and version control, collaborative data science, container technology, and basic and advanced machine learning. Sign up for which tutorial sessions you wish to attend by going to this link and following the instructions. Note that most tutorials run more than once. and here is a Google Doc where you can enter questions you would like them to be asked. A national meeting of new CDT students will be hosted by ScotDIST in Edinburgh on November 19th-21st 2018. Accommodation will be in Pollock Halls, part of the University halls of residence. The meeting itself will be held in the Bayes Centre, a cross-disciplinary institute of the University. This website is published by the University of Edinburgh.